This book investigates whether an international institution can alter state behaviour and thereby contribute to the peaceful resolution of a conflict. 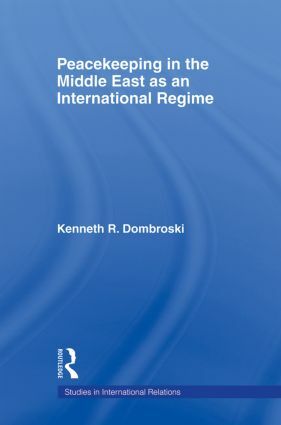 Kenneth Dombroski focuses on the series of interrelated peacekeeping efforts undertaken to help resolve the Arab-Israeli conflict from 1948-1994. Analyzing these sequential operations over a forty-six year period provides evidence as to the relative importance of institutions in a state-centric international system. He provides an alternative approach to the study of international peacekeeping that evaluates the long-term effects of peacekeeping on state behaviour, and concomitantly, the effects of varying state behaviour on an international regime. This book offers new perspectives on the relative importance of regimes, the utility of regime analysis in explaining the importance of international institutions, the significance of a peacekeeping regime's role in influencing state behaviour, and the impact of varying state behaviour on regime evolution.